Former President of Guyana, Donald Ramotar on Tuesday welcomed the judgement by the Caribbean Court of Justice (CCJ) that a parliamentary amendment of the Constitution to provide for presidential term limits is constitutional. Ramotar, who was President from 2011 to 2015, added that “I believe they had very strong grounds to rule the way they ruled” and added that presidential term limits is good for Guyana. The CCJ panel of judges ruled 6-1 in favour of term limits. “I think at the time when it was done it was felt that it was good for the country. I don’t think nothing much has changed to change that position. When it was done it was thought that it was going to be the best thing for our country and I don’t think nothing much has changed,” he told Demerara Waves Online News. Repeated efforts to contact former President, Bharrat Jagdeo proved futile as calls to his mobile phone went unanswered. “That was my thinking along that this was a deliberate attempt which was unanimously passed. First of all, it went through a broad consultative process on the ground and that was what the people said they wanted and it was also the proposal of all of the political parties and when it went to the Parliament it was unanimous,” Ramotar told Demerara Waves Online News. The former Guyanese leader is said to be part of a grouping that does not include Jagdeo, Irfan Ali, Hydar Ally, Indra Chandrapal, Clement Rohee and Frank Anthony. In the past, Ramotar had openly Anthony to succeed Rohee as General Secretary of their People’s Progressive Party (PPP). In the end, Jagdeo emerged as General Secretary and de facto party leader. Another long-serving executive member of the opposition People’s Progressive Party (PPP) has also welcomed the decision by the Trinidad-based regional court that is Guyana’s court of last resort and CARICOM trade dispute settlement body. “I think it’s a good decision because the intention of the people who had framed the constitution was to have term limits,” he said on condition of anonymity. The PPP official recalled that during extensive consultations in 1999, Guyanese had wanted “two terms- full-stop”. “It reflected the will of the people across this country to have a two-term limit and I think it’s a good decision what people were looking for,” said long-serving politician. For its part, the CCJ took a similar position that the amendment had emerged out of a broad national consensus. “The CCJ felt that it was clear that the amendment did not emerge from the desire of any political party to manipulate the requirements to run for the office of President. The Constitution was amended after extensive national consultation and therefore represented a sincere attempt to enhance democracy in Guyana,” the court said. The CCJ upturned decisions by Guyana’s High Court and Court of Appeal, in the case of Cedric Richardson v the Attorney General, and ruled that the country’s constitution was properly amended to provide for term limits. Richardson, who some believed was shadowing for Jagdeo- a two-term president- because he wanted to run again in the 2020 general elections, had argued that that section of the Constitution could only have been amended by a referendum and not by Parliament. In the case of the Attorney General of Guyana v Cedric Richardson, the Caribbean Court of Justice (CCJ) ruled that an amendment, that barred Presidents of the Republic of Guyana from serving more than two terms in office, was a valid amendment to the Constitution. The amendment, which was made to the Constitution of Guyana in 2000, also added the further qualifications that a candidate for President must be a Guyanese by birth or parentage, residing in Guyana on the date of nomination for election, and continuously resident in the country for a period of seven years before nomination day. The Attorney General of Guyana appealed to the CCJ challenging the majority ruling in the Court of Appeal. The main issue in the appeal was whether the additional qualifications set out in the amendment diluted the rights of the electorate or undermined the sovereign democratic nature of the state of Guyana as prescribed by Articles 1 and 9. Rt. Hon. Sir Dennis Byron, the Court’s President, the Hon. Mr. Justice Adrian Saunders and the Hon. Mr. Justice Jacob Wit. The Hon. Mr. Justice Winston Anderson offered a dissenting judgment. The majority’s view was that Articles 1 and 9 did not confer on citizens an unlimited right to choose the head of state. Democratic governance allowed for reasonable qualifications for eligibility to be a member of the National Assembly and hence to be President. This was supported by objective, international standards of what a democratic state entails. The CCJ also stated that new qualifications can be introduced by valid constitutional amendments and that the National Assembly had the power to amend the Constitution by a vote of at least two-thirds of all members of the Assembly, without holding a referendum. The Court outlined guiding principles for assessing when new amendments to the Constitution did not require the holding of a referendum. Ultimately, the test was whether any such new amendments were “reasonably justifiable in a democratic society”. To determine this, any court called upon to assess such a matter should “look to the history, substance and practical consequences of the amendment, to the reasons advanced for it and to the interests it serves”. The Hon. 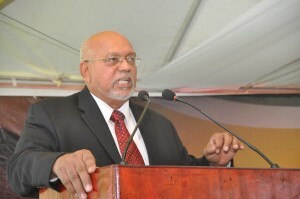 Mr. Justice Winston Anderson, in his dissent, agreed with the Court of Appeal of Guyana that the amendment was unconstitutional because it resulted in the exclusion of probably thousands of otherwise eligible Guyanese citizens from being elected as President, without seeking the approval of the people by referendum. He considered that this was an unacceptable constraint on the sovereignty of the people of Guyana to choose their President as provided for in Articles 1 and 9.